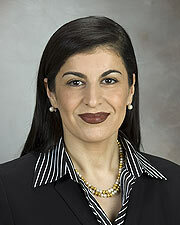 Farzaneh Banki, M.D., is a physician and associate professor for the Department of Surgery at McGovern Medical School at The University of Texas Health Science Center at Houston (UTHealth). Her clinical interests include: diagnosis and treatment of Gastroesophageal Reflux Disease (GERD), Esophageal Motility Disorder, malignant diseases of the Esophagus and Stomach, as well as benign and malignant diseases of Lungs and Airway. Her current focus on research is to assess the role of plasma DNA in the screening and diagnosis of primary, metastatic, and recurrent esophageal cancer. Dr. Banki primarily sees adult patients. She focuses on providing high quality comprehensive healthcare to her patients. A new program designed to increase the overall satisfaction of patients undergoing esophageal surgery has resulted in lower patient costs and reduced times on both the operating table and in the hospital. Dr. Banki is very active in her research efforts. Her medical publications can be viewed on the link below.